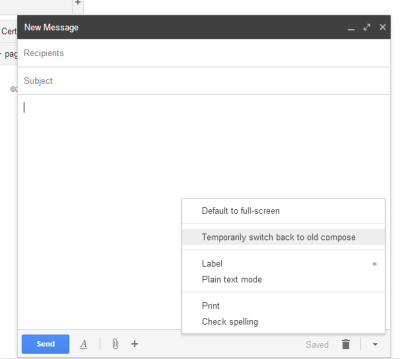 If you're still using Gmail's old compose interface, you should switch to the new interface. In a few days, the old compose UI will no longer be available, so it's a good idea to learn more about the new UI and try to adapt. The new compose box has been launched in October 2012, so it's not that new anymore. Google added some new features since then: inserting emoticons and event invitations, adding labels to outgoing messages and a full-screen mode you can set as default. The full-screen mode is closer to the old interface and it's consistent with the mobile interface. "A few weeks ago we added a full-screen option to the new compose. Now that that option is available, we're saying farewell to the old compose and switching everyone to the new compose over the next few days. The new compose opens drafts as a minimizable window so you can write multiple drafts at once, keep an eye on incoming email, adds support for inline images and much more. If you prefer a full-screen compose experience, you can click on the expand button in the top right of the new compose window to switch to full-screen and then set it as the default by selecting Default to full-screen in the more options menu in the bottom right," explains Google. I'm sure that a lot of people will complain and say that the old interface is better. I've used the new compose box ever since it was released and I think it's great. 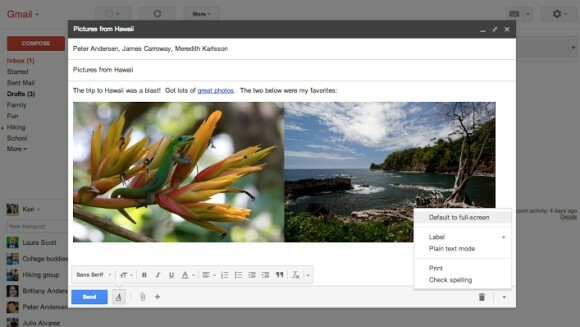 You can use other Gmail features while composing a message, you can write multiple messages and there aren't many links and buttons that get in the way. I've briefly switched to the old compose experience and I was surprised to see how cluttered it was: "add cc", "add bcc", "insert invitation", "check spelling", a lot of rich-text editing buttons. It looked like a document editor, not like a communication software. This quote sums up everything that's importat about the new compose layout: "You can now write messages in a cleaner, simpler experience that puts the focus on your message itself, not all the features around it."